Violet MacNeish Kay (1914-1971) was a painter in oils and watercolour and a teacher in Arts and Crafts. 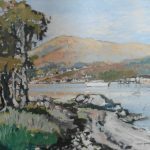 Kay was born in Glasgow in 1914, the daughter of artist James Kay. She studied at the Glasgow School of Arts and exhibted at the RSW and the RSA.